If you follow what I’m up to on the blog or in interviews you’ll no doubt have seen me banging on at some point or another about this book. It’s made a huge impression on me since I acted on John McCready’s recommendation earlier this year. This followed a conversation with John, former Face / NME journalist, Haçienda DJ, TV producer and Situationist archivist, about a couple of books from recent years that I’ve been particularly partial to, namely ‘Sit Down! Listen To This!’, Bill Sykes’s oral history about the great DJ / promoter Roger Eagle, and ‘Yeah Yeah Yeah: The Story Of Modern Pop’ by cultural commentator Bob Stanley of Saint Etienne. John asked me if I’d read the KLF book, which was published in 2012. I’d heard something about it previously, although this obviously hadn’t prompted me to buy a copy, but John’s recommendation had brought home the connection between Roger Eagle and The KLF’s Bill Drummond – Eagle had managed Drummond’s first band, Big In Japan, back in late ’70s Liverpool, when he was running the seminal alternative club Eric’s on Mathew St (just across the road from where The Beatles had played many many times at The Cavern in an earlier era). Big In Japan never had any success as such, but are retrospectively remembered as a supergroup in reverse – apart from Drummond, a number of other members going on to bigger and better things (Holly Johnson with Frankie Goes To Hollywood, Ian Broudie with The Lightning Seeds, Budgie with Siouxsie & The Banshees, Jayne Casey as a partner in Liverpool superclub Cream, Clive Langer, who’d become a leading record producer, and Dave Balfe who, as well as being a member of The Teardrop Explodes, would also manage them along with Echo & The Bunnymen in collaboration with Drummond – later down the line Balfe would found Food Records, sign Blur, and have a track by the band, ‘Country House’, written about him). It’s these networks of connectivity, which the book unveils so well, that John knew would float my boat. I bought it immediately and devoured it in no time – it’s a breeze of a read and great fun on the one hand, whilst containing all manner of hidden depths on the other. 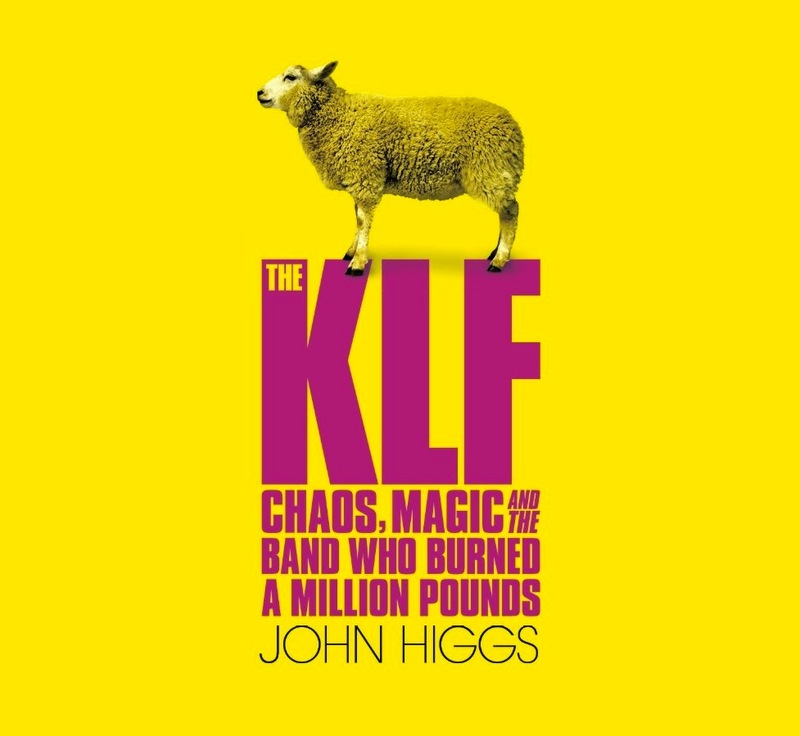 In attempting to shine a light on why Bill Drummond and his KLF partner, Jimmy Cauty, without being able to properly explain their actions, would court so much outrage and offence by burning a million pounds cash on the Scottish island of Jura on August 23rd 1994, author John Higgs weaves a tapestry of happenstance and synchronicity which links a stellar cast of interconnecting characters including Carl Jung, Alan Moore, Ken Campbell, JFK, Robert Anton Wilson, Kerry Thornley and Doctor Who. A main thread of the book is the Robert Shea & Robert Anton Wilson epic fiction ‘The Illuminatus! Trilogy’ (1975), which took the Discordian ideas of Kerry Thornley & Greg Hill and proceeded to open up a Pandora’s box of conspiracy theory that reverberates right through until this day; with many people now peddling these once fantasies as fact in an example of life imitating art, or perhaps art seeping into life. Bill Drummond & Jimmy Cauty released music not only as The KLF (with an Illuminatus! inspired pyramid logo design), but as The Justified Ancients Of Mu Mu, a name, albeit slightly misspelt, lifted directly from the pages of ‘The Illuminatus! Trilogy’. In the book, The Justified Ancients of Mummu are the arch-enemy of the Illuminati, who, amongst other things, control the music industry. Drummond & Cauty had set themselves up as battling the evil empire via their prankster style guerrilla Pop, and scored big with their novelty hit, ‘Doctorin’ The Tardis’, a UK #1 in 1988, released under the name The Timelords. As the rave era took shape, this set them up for major success with The KLF a few years down the line, with what became known as their ‘Stadium House Trilogy’, the singles ‘What Time Is Love?’ (1990), 3 A.M. Eternal’ (1991) and ‘Last Train To Trancentral’ (1991), as well as ‘Justified And Ancient’ (1991), featuring the unmistakeable vocals of Country legend Tammy Wynette, who sang about ‘standing by The JAMs’ (short for Justified Ancients Of Mummu in the book), a take on her most famous recording ‘Stand By Your Man’ (a UK #1 16 years earlier, in 1975), plus ‘America, What Time Is Love?’ (1992), a rework of the single that kick-started this impressive run of hits, all of which reached the UK top 5. Add into the pot their top 3 album, ‘The White Room’ (1991), and you’re looking at a money-spinning juggernaut. The KLF were the Pop kings of the early ’90s, their records selling like proverbial hot cakes on a global scale, with the world very much their oyster. However, having seemingly conquered the music business, they realized that, to the contrary, they’d been co-opted, and this provides a major clue as to why they not only torched the cash, but did something that would hurt their pocket even more so – delete all their back catalogue, a decision that would cost them millions. This is why you never come across any tracks by The KLF on compilations that define an era in which they played such a key role. They pretty much tried to erase themselves, to the best of their ability, from history. 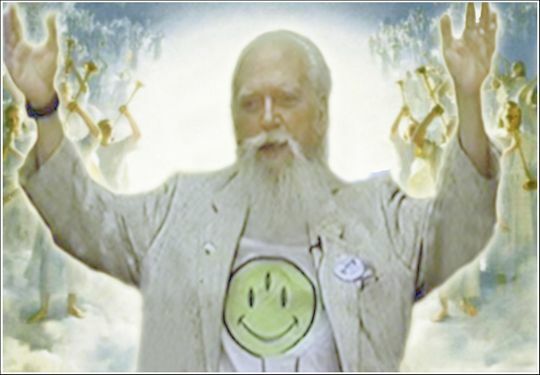 John Higgs had originally intended to write a book about Brooklyn born Robert Anton Wilson, having interviewed him in his home state of California not long before his death in 2007 when writing ‘I Have America Surrounded: The Life Of Timothy Leary’ (2006), but decided that Wilson’s own books were better suited to telling his story than any biography he might muster. Instead he revitalizes Wilson’s contribution to literature and culture via the KLF book, which I regard as one of the must-reads of recent times – a richly symbolic modern day mythos, and certainly unlike any music book I’ve read before. Higgs himself refers to it as ‘a gateway drug’, which is an apt description, for it’s a book that can lead the inquisitive on into many other captivating areas of cultural alchemy and esoteric adventuring. 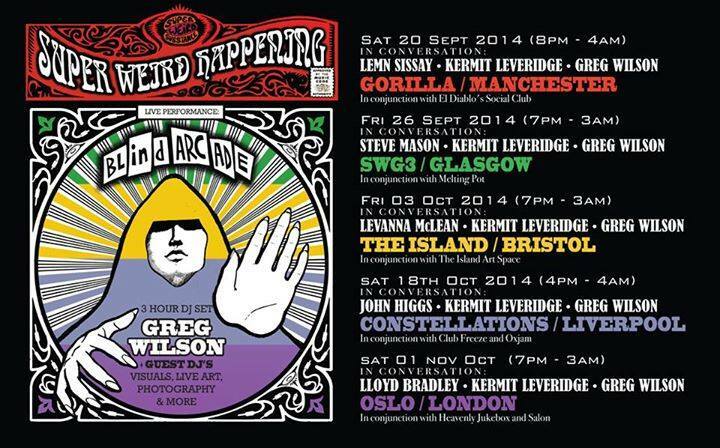 It turns out that John Higgs had been in Liverpool the previous February, the 23rd to be precise (23 holding special significance for Discordians), at The Kazimier, as part of a crowdfunding campaign for a play written by Daisy Eris Campbell based on the book Robert Anton Wilson wrote directly after ‘The Illuminatus! 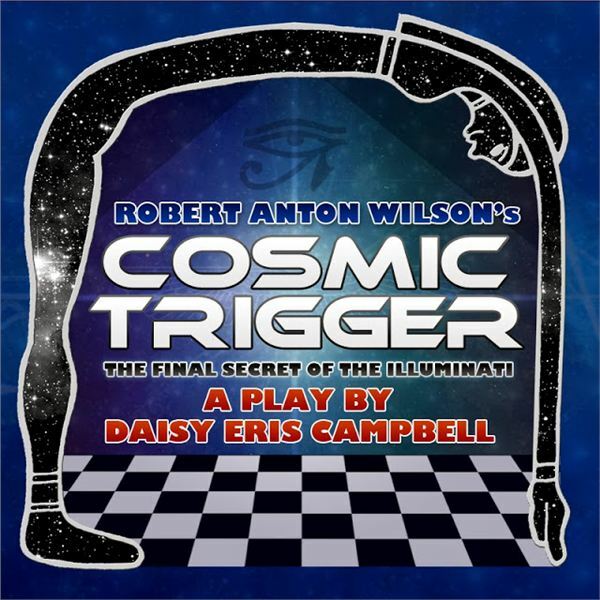 Trilogy’ (this time without Robert Shea’s collaboration), 1977’s ‘Cosmic Trigger: The Final Secret Of The Illuminati’, which unlike its predecessor is autobiographical. I’d picked up on the Kazimier event beforehand because it included a video interview with comic writer and modern day mage Alan Moore (on the subject of Robert Anton Wilson), and as any regular visitor to my blog will know, I’ve become something of an Alan Moore devotee during the last few years, so the fact that he was in some way connected with an event in my home city certainly aroused my interest. That said, I was heading out to Australia and the start of a tour on the 24th, and with a whole heap of stuff to sort out in the run-up, I suppose the only thing that would have tempted me to attend was Alan Moore being there in person. As fate would have it I never flew to Australia the following day for, on the 23rd, I was informed, after a week or so of uncertainty, that my flights had been cancelled and there was to be no tour for me. Now I think about it, given what I’ve since come to understand regarding the Discordian patron deity Eris, chaos slapped me full in the face that day (Eris being the Greek goddess of chaos, strife and discord). My plans were thrown right up in the air, but after the initial shock had worn off I resolved to use this unexpected time on my hands productively, immersing myself full-on into working on the tracks that would subsequently form the ‘Blind Arcade Meets Super Weird Substance In The Morphogenetic Field’ mixtape, which would take such a defining role in my year, leading to the series of 5 Super Weird Happenings, which only concluded at the beginning of this month. It was during the time that I was still supposed to be in Australia that I met up with John McCready and he mentioned the KLF book. Had the tour not been cancelled it’s unlikely I’d have read it at the point I did, and the sequence of events that have happened since would have taken a completely different course. Everything for a reason they say. By the time I’d completed the mixtape, towards the end of April, the KLF book had not only been read, but also referenced via the ‘Donnie Darko’ samples I used, where Donnie is talking to the teacher about the money burning passage from Graeme Greene’s short story, ‘The Destructors’ (Bill Drummond’s rabbit god, Echo, who we hear about in the book, is also evoked via Frank in the film, who, in turn, is sampled on the mixtape). Alan Moore, who, as I’ve mentioned, is a key influence, not least given that the term Super Weird Substance is something I first heard him utter, is also the subject of a whole chapter in the book, whilst being one of the sample sources on the mixtape. The connections and crossovers were starting to crystalize. It was clear that the mixtape and the KLF book were somehow kindred spirits, tuning into similar channels. The mixtape marked the resumption of my work with Kermit Leveridge, who’d approached me to produce his new project Blind Arcade. It was 23 years on from the last time we collaborated back in 1991 on the final Ruthless Rap Assassins recordings. The Assassins had disbanded at roughly the same time as The KLF called it a day, but from the opposite side of the spectrum – the reason for their demise being a lack of commercial success, despite a bagful of critical acclaim. Kermit went on to hook up with Happy Monday Shaun Ryder to form Black Grape, and he’d experience the dizzy heights of Pop stardom a few years on when their debut album topped the charts. Kermit (a fully fledged heroin addict throughout the ’90s), having injected himself within a millimetre of his life, would have to retreat from the music business to lick his wounds as the new century began to unfold, and eventually undergo a major heart operation resulting from his folly. Having made a remarkable recovery, a rejuvenated Kermit had been on a creative mission ever since, furiously writing away at every opportunity. The mixtape would tell his tale of redemption. 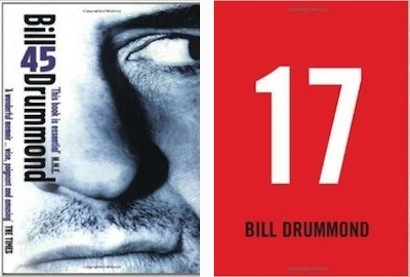 I’ve subsequently discovered Bill Drummond’s own writings, having now read the thoroughly enjoyable ‘45’ and ‘17’. He approaches these books more in the style of a diarist and, as well as giving me deeper insights into aspects of the John Higgs book, there’s many a nugget of wisdom to discover in the words he puts to paper, and plenty of stuff you can only shake your head at in bemusement – bloody hell, Bill, so it’s you to blame for Stock, Aitkin and bleedin’ Waterman! 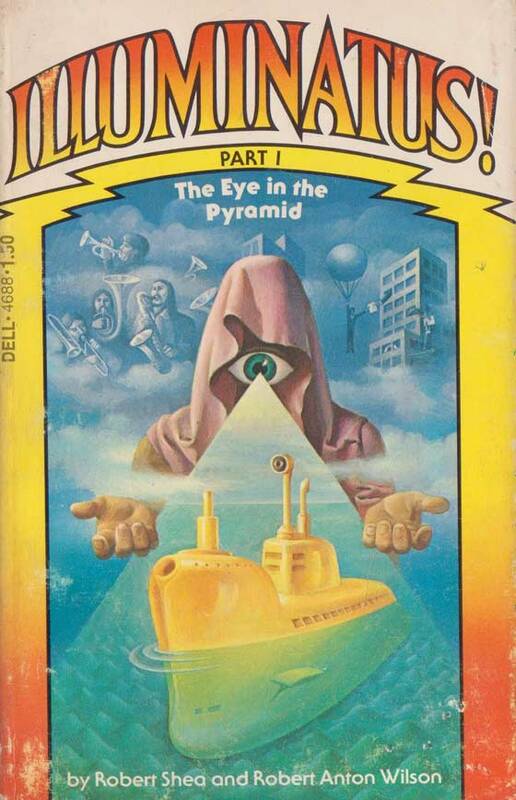 I’m not 100% sure what it was that gave me the impetus to read ‘Illuminatus!’ at that point, but I figure it resulted from a conversation with my then 13 year old son who was fascinated with all the conspiracy theories surrounding the Bavarian Illuminati. It’s something that’s caught the imagination of many a teenager in recent times, with the internet a window on an ever more complex web of intrigue surrounding this shadowy order who the history books tell us were active between 1776 and 1785, but whom conspiracists believe continue to thrive as a secret society up until this very day, with their fingers in many a pie of power. I remember the book being a largely incomprehensible romp, which was almost impossible to navigate given I had few points of reference to cling to at the time. I soldiered on until I got about a third of the way through, but when the pages started to come out, the glue melted by the Croatian sun (I was over there for the Garden Festival), I gave up the ghost. I later found that, despite it’s pivotal influence on The KLF, Bill Drummond had given up twice himself before finally reading it fully, and only then after he’d been invited to speak at a 2007 tribute to Robert Anton Wilson in London, organized by Coldcut and Mixmaster Morris following his death that year, and where other speakers included Alan Moore and Daisy Eris Campbell’s dad Ken Campbell. 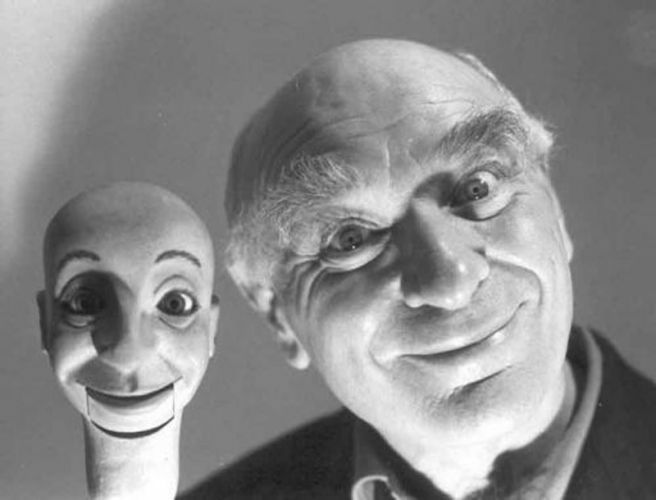 Ken Campbell died unexpectedly the following year. 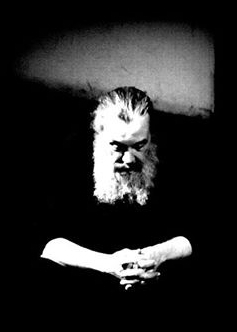 He was a writer, actor, director and champion of experimental theatre who made a lasting impression on many people who came into his orbit, including a young Bill Drummond, who built the sets for his production of ‘Illuminatus!’, which made its debut at The Liverpool School Of Language, Music, Dream And Pun down the road from Eric’s in Mathew Street on November 23rd 1976. When I was thinking about a suitable guest for the ‘in conversation’ section of the Liverpool leg of our Super Weird tour, John Higgs seemed the perfect candidate. I didn’t know him though, and didn’t know anyone who knew him, so I found him on twitter and tweeted away. He tweeted back and, to my delight, was more than happy to come along and talk about the book. Having fabled Liverpool DJ Bernie Connor host the talks was particularly poignant, for Bernie is someone whose life was entwined by the Eric’s scene and what was happening around Mathew St, Liverpool School Of Language, Music, Dream and Pun included. A young Bernie was there, already a protégé of Roger Eagle, quietly sipping his cup of tea and eating his piece of cake at the epicentre of this synchronistic ignition. Further to this, just 5 days after our Happening, on October 23rd the Everyman Theatre in Liverpool was presenting a day of 23 events in 23 places revolving around, you’ve guessed, the number 23. The coincidences were stacking up high! I’d already made email contact with Daisy Eris Campbell by this point, and this resulted in her eleventh hour inclusion at our London Happening on November 1st, delivering a talk about the ‘weird and wonderful forces aligning around Cosmic Trigger’. Daisy, it turned out, had met John Higgs after he interviewed her mother, the actress Prunella Gee, who’d suggested, having so much in common, the two of them hook-up. Prunella Gee took the role of Eris in ‘Illuminatus!’. She also began a relationship with Ken Campbell on set, with Daisy reputedly conceived backstage at The Liverpool School Of Language, Music, Dream And Pun – hence her middle name. On October 23rd I attended the 23 day in Liverpool with Kermit and Josh Ray. Daisy, of course, was involved, and we got to see her talk before hooking up later for dinner and conversation. This very splendid day was rounded off with a performance of ’23 Enigma’ by Jeff Young at The Everyman. It’s clear that Daisy has taken the baton from her father and is on a quest to, as one of Robert Anton Wilson’s great influences, psychedelic guru Timothy Leary put it, ‘find the others’. As Ken Campbell proved to be such a catalyst back in 1976, with the help of John Higgs and his gateway drug so too can she at this juncture in time – the process is already well underway, with the others beginning to gather. I’m very much looking forward to seeing the 4 hour-long play this weekend. I read the ‘Cosmic Trigger’ book in preparation, and I can paradoxically state that it was just as I expected it to be whilst being nothing like I expected. As Bill Drummond puts it, ‘embrace the contradictions’. Robert Anton Wilson is clearly a formidable thinker with a fascinating perspective, the book drawing on 3 key inspirations, Timothy Leary, Aleister Crowley and G.I. Gurdjieff. The time certainly seems ripe for a re-appreciation of his ideas, both those concerning inner space and outer space. As above, so below. And so it comes to pass that DJ Mixmaster Morris, who was to have provided the musical finale for the Cosmic Trigger weekend in Liverpool, is unable to make it. The upshot is that I’ll be taking his place, bringing Disco to the Discordians between 8-10pm on Sunday evening. It’s just worked out that way, as these things do. What’s clear is that a great degree of connectivity is taking place at present, with previously disparate groups of people beginning to come together from their different angles. I feel that this process will accelerate during 2015, the year Alan Moore tells us marks the time where, due to information overload, our culture moves from a fluid state, past the boiling point, and on into a ‘culture of steam’. Where it leads I’m not quite sure, but events have conspired to magnetize people together and I’m happy to be along for the ride, finding common ground with like-minded souls. Popular culture will, I’m sure, reflect this in the coming years – from painters to poets to musicians to DJs. The old order is crumbling and it’s going to take a while before the dust settles again, providing an opportunity, in the haze of chaos and confusion that will surround us, for people to boldly remove the safety catch and take chances they perhaps mightn’t have done previously. For, in order to help us make sense of this world of breakneck change in which we live, the perceptions of the artist are needed more than they have been for a long time. Daisy Eris Campbell filmed at London Super Weird Happening by Tim Collins. 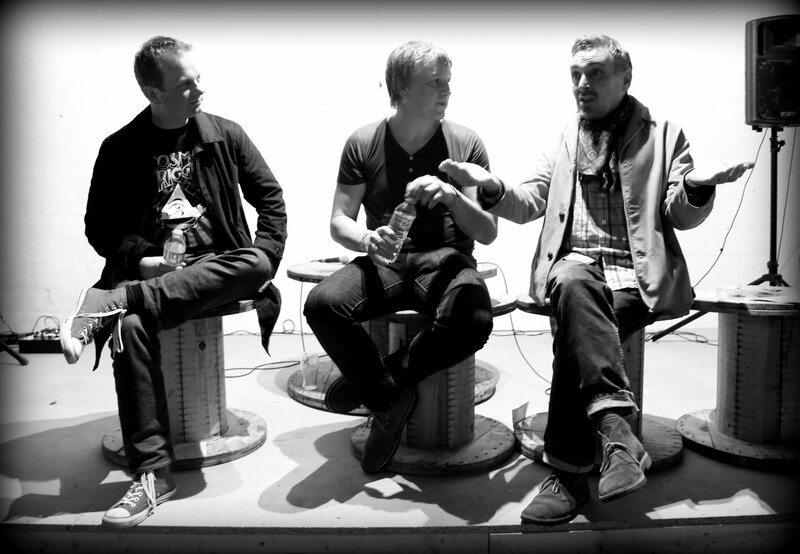 Photos of Alan Moore / John Higgs, Greg Wilson & Bernie Connor by Elspeth Moore. 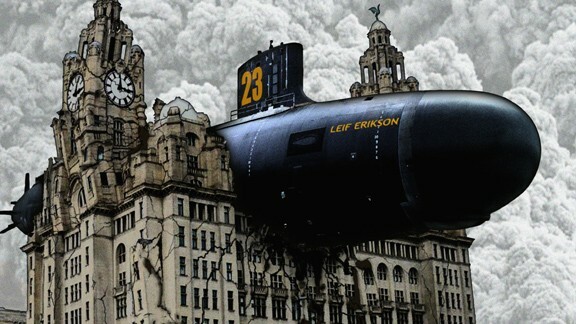 Leif Erikson artwork by Jimmy Cauty. The 23rd greatest adventure begins…..
Nice post, john’s book had a profound effect on me also – where does that last illustration of the leif come from? Thanks for pointing out that anomaly James. I’d guess that they made a number of long-term agreements pre-deletion, which would explain the ‘Now’ comps around a decade ago, and the Tammy Wynette ‘Best Of’ comp in the late 90’s. Most of the latter inclusions seem to be overseas releases, possibly bootlegs in a number of cases – I suppose that what I meant is that you never see The KLF on any current dance compilations (MInistry Of Sound etc) documenting the Rave era – they’ve written themselves out of history in that respect.